Liverpool entrance to Birkenhead Tunnel. Taken on a weekday. Traffic volumes off peak are very light. 1. The Mersey Tunnels are 3 Tunnels under the River Mersey linking the Wirral peninsula to Liverpool. A 4 lane Tunnel, opened in 1934, links Liverpool to Birkenhead. 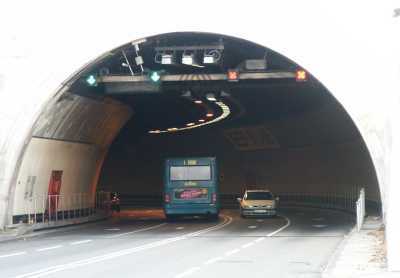 A pair of 2 lane Tunnels, opened in 1971 and 1974, link Liverpool to Wallasey and the M53. 2. The Tunnels have been controlled since 1986 by the Merseyside Passenger Transport Authority, known as Merseytravel. It is a local authority who's members are nominated by the 5 Merseyside district councils of Liverpool, Wirral, Sefton, St Helens and Knowsley. Merseytravel also control the local railways and the ferries, pay for free travel passes for over 60s and disabled, and provide bus stations and some other bus related services. (Most bus services are provided by Arriva and other private companies.) Merseytravel are funded by various grants (mainly for the railways) and from a levy on the 5 districts. 3. The government wanted the original Mersey Tunnel to be Toll free. But it agreed to pay half of the original estimated cost of £5 million, providing that any tolls would only be for a limited period (initially set as for a maximum of 20 years). A large part of the building cost and the running costs were supposed to come from rates in Liverpool and Birkenhead. The two councils managed to claw most of this back and after 1947 were getting all their contributions refunded. 4. When a second crossing was needed, the consultants initially recommended a 6 lane bridge. The authorities instead decided to build a 2 lane tunnel, and then 3 years later decided to add another 2 lane tunnel. The actual construction costs turned out 50% higher than estimated. 5. Due to the construction overspending, high interest rates and lower than expected traffic, the Tunnels were now losing money at a staggering rate. Tolls were increased 500%(10p to 50p) in stages, but the losses continued. The losses were just added to debt and had to be borrowed for, creating bigger losses. 6. The government refused from October 1988 to extend the practice of adding losses to Tunnel debts. Losses then fell on the rates till losses stopped in March 1992, following 2 further Toll rises (in 1989 and 1992). Tolls were now 1000% higher (10p to £1) than before the opening of the Wallasey Tunnel. During the loss making period from 1971 to 1992 most of the losses had been added to Tunnels debt, only 25% was charged to Rates. b) A 20% toll rise in 1998.
c) The cost of loans falling. d) In 1994 Merseytravel started charging Tunnels for repayment of the �.5 million losses that had fallen on the rates beteween October 1988 and March 1992. They are charging �7 million a year, including interest at 9%. e) Large spending on capital schemes which has been charged to tolls. f) Increased spending on staffing, maintenance, administration etc. 9. Starting in 1999, Merseytravel have been trying to get the law changed by a Private Bill. This would make it easier for them to increase tolls, never reduce them and use the profits elsewhere. Their first Bill would also have privatised the Tunnels for a period of 25 years. 10. Merseytravel also tried last year to get another Toll Increase using the old law. But that was abandoned.